Welcome to all customer to know about the Robi 5GB Internet 93Tk Offer. 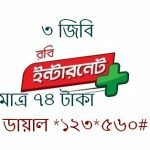 Bangladeshi most popular telecom operator Robi has come to their valuable customers to enjoy this special 5GB Internet 93Tk. In this time, 5GB data 93tk offer is the most essential for all Robi internet users. It is really exciting and low price internet offer to others operators. The customers who want to buy this package or know more details how can activate this special 5GB internet offer, please read this full content to get a clear concept. In this bellow, I will share to all details to activate this offer. 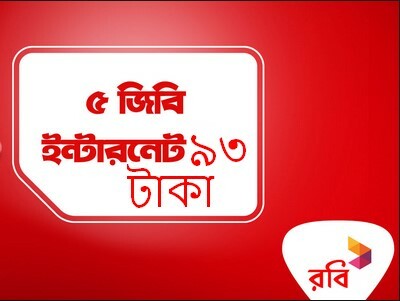 Robi all selected customers are eligible to buy this special 5GB Internet package. To activate this special 5GB 93Tk offer, customers need to dial USSD Code *123*576#. Validity this special package in 5 days. Customers will use this data in 24 hours for unlimited uses. To check your internet package offer, just simply dial *8444*88#. This offer will run until the 30 May. Now all customers got a clear concept about the Robi 5GB Internet 93Tk Offer. If you want to know or face any problem to activate this special package offer, please comment the box. We will try answer as soon as possible.